« So could there be an October coup? A new poll in the Irish Times today suggests that the outcome of the October 2nd referendum on whether Ireland should ratify Lisbon is getting tighter. 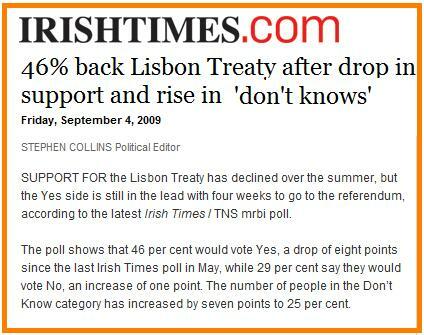 At this stage before the 2008 referendum an Irish Times poll had YES 35%: NO 18%: DON’T KNOW 47%. The actual result, as I’m sure we are all aware, was a victory for the NO camp. But other data in the survey suggests that the YES camp have some things to be optimistic about. Their supporters are more likely to say they will vote than those saying NO. PaddyPower make it 1/9 YES with 9/2 NO. The price on the YES percentage being 50.01 – 55% has tightened to 15/8. Last week I got on this at 5/1 and I know other PB regulars got even longer odds. Ladbrokes have it it YES 1/5 with 3/1 against NO.